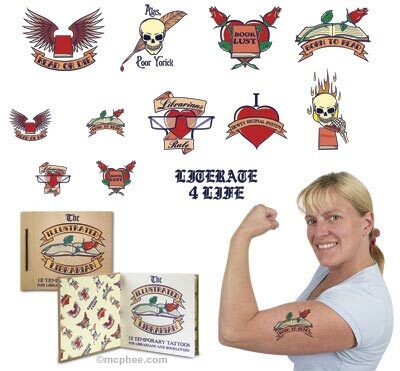 I’m very entertained by the idea of this temporary tattoo booklet from PatinaStores.com. You can view a close-up of one of these beauties at Evil Mad Scientist Laboratories or click on the photo below to see smaller versions of all the tats to be found in this booklet. A search for "tattoos" and "book" on Flickr yields a clever Vonnegut salute, and (holy cow!) a winner in the Connect-the-Dots category. There’s also an open book, splayed pages, books on a shelf, a fiery typewriter, a reference to To Kill a Mockingbird, a tribute to Snape, Harriet the Spy (! ), an ant traveling by tesseract, another ampersand fan, and (my favorite) an image adapted from the cover of Ann Fadiman’s Ex Libris. We book lovers are so attached to the objects of our passion that it make sense to me that some of us would want to wear those objects in a literal, permanent fashion. Are you one of those folks? Or do you WISH you were brave enough to be? If so tell us about your real-life book tattoos, dream-life book tattoos, or book tattoo sightings. This entry was posted in Uncategorized on July 10, 2008 by Alison Morris. I’m really looking forward to getting a book tattoo. Want an open book on my ankle or maybe wrist. The ones above are great! It’ll be my third tattoo and I really want it to be something personal. xmassheep, Sorry! I came across your photos via a keyword search, which took me to individual images rather than the actual set, which means I never saw your disclaimer. I’ve taken out the link and will definitely get your permission before linking to any of your pics in the future. we have made temp tattoos a couple of times with the permission of artists Calef Brown and Marla Frazee, and our logo and phone. Super cute! If I were to ever get permanent ink it would be either Snowy in his space suit or Moomintroll. I have definitely toyed with the idea of getting a tattoo of Max! Go to the Archie McPhee site and do a search for librarian. You’ll see pics of all the tattoos. Alison, you should get the hookup, as I did, from your sister-store. 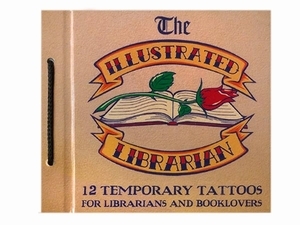 I bought the Illustrated Librarian tattoo book from the Brookline Booksmith. For me, that’s as close as I get to permanent ink. I have an ex libris plate with an open book, tiny devil and pen on the inside of my bicep. The woman who did a small tattoo on my back had one of the greatest book tattoos I’ve seen before a since – the cover illustration from Still Life with Woodpecker on her thigh. This librarian has a rose tattoo on her left shoulder- had to after reading ‘Rose Tattoo’! I LOVE the idea of the temporary tattoos in the book covers of new books. I’d DEFINITELY wear them (yes, I have worn temp tattoos and have been looking for more), but only for the books I like. Sure beats the usual bookmark, of which I have enough of for the rest of this life time, thank you. I have a book tattoo – Shelley Jackson published her short story ‘Skin’ in the form of tattoos, one word per person and I’m one of her words! Intruigingly enough, the owner of that connect-the-dots tattoo *works* in kids’ books — that’s Colleen Venable from Roaring Brook. Proof, I think, that kids’ book people really ARE the coolest…. I was a huge Nancy Drew fan as a kid, so when I went to get my first tattoo I brought in one of the original blue and orange hardcovers from the 1930s and had Nancy’s silhouette, the one with the cloche had and bias-cut dress, tattooed on my arm. My favorite thing about it is that people of all ages recognize that it’s Nancy and get bright-eyed as they tell me how much they love the books. I would love to get a Moomin tattoo one of these days, but I haven’t really figured out what or where. My cat is called Little My, though, so perhaps that’s enough. why not put temporary tattoos of book covers in new books so you could advertise what you’re reading if you choose to? great marketing.